Firestone of Southgate, Michigan named as Fleet Services provider for SS Graphics Inc.
Jeff Wandyg, Store Manger will be the contact person for all required services. For more details contact Scott Smiddy at SS Graphics Inc. Corporate Offices ext. 11. There are 181 state legislature seats in the state of Texas up for election in 2006. This design has the candidates information imprinted over the Texas state silhouette. Political campaign yard sign design for the Texas Primary Elections on March 7, 2006. Ready made sign design can be ordered online at www.SignOutfitters.com This sign is available in a weather resistant poster board version and also in a corrugated plastic version. State of Texas theme based bumper stickers and Car Magnets are also available at a reduced price when ordered with yard signs. 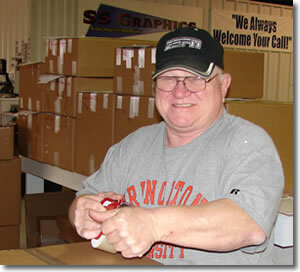 SS Graphics Inc. would like to welcome its newest team member Tom Trancygier. Trancygier will lead Post Production Packaging and Shipping. Tom's previous experience includes 33 years of employment with the Wayne County Michigan Waste Water Treatment Facility as a Waste Water Specialist. 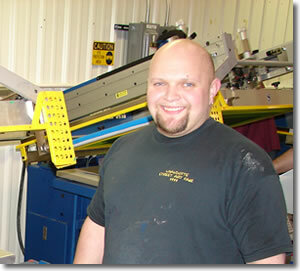 Tom's responsibilities will include packaging and shipping of corrugated plastic yard signs, weather resistant poster board signs and sign wires from our Wyandotte, Michigan facility. He will coordinate multi-package shipments to California, New York, Florida, Texas, Pennsylvannia, Indiana and Illinois. With a changeable letter sign banner you can change your message as often as you like. Made from heavy vinyl sign banner material. Designed for indoor or outdoor use. Each row has a protective vinyl top-flap to keep the letter individual pockets free from debris. 24 individually sewn sign letter pockets allow for a nearly endless array of messages and slogans. Large 3 foot x 10 foot vinyl banner with 24 letter pockets. 141 - 8 inch Black Letters, Red Numbers & Characters. 4 - Nylon ropes to attach to just about anything. We are pleased to announce our new nation wide Black Signs dealership. SS Graphics Inc. now offers BlackSigns.com's complete product line. 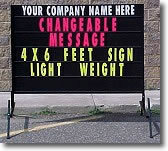 The Black Sign is a high impact, low cost portable sign with bright fluorescent colors. The Black Sign demands your audiences attention whether they are coming or going since it has dual-sided signage capability. Additionally, the Black Sign is not encumbered by deadlines (as radio, coupon mailer and TV) or of a size that makes changes nearly impossible (such as billboards). The Black Sign can change messages in as short a time as 10 minutes! Black Signs.com has found a patented way to make fluorescent colored vinyl that is durable for at least 24 months. Other knock-off signs use fluorescent vinyl that lasts only 90 days before it fades and cracks. 24 x 18 & 18 x 12 Corrugated Plastic Yard signs is 3 - 4 business days. 22 x 28 Weather Resistant Poster Board is 3 - 4 business days. Poly Bag Yard Signs is 8 business days. Static Cling Decals 10 business days. There are 117 state legislature seats in the state of West Virginia up for election in 2006. This design has the candidates information imprinted over the West Virginia state graphic. Political campaign yard sign design for the West Virginia Primary Elections on May 9, 2006. Ready made sign design can be ordered online at www.SignOutfitters.com This sign is available in a weather resistant poster board version and also in a corrugated plastic version. State of West Virginia theme based bumper stickers and Car Magnets are also available at a reduced price when ordered with yard signs. There are 24 state legislature seats in the state of Nebraska up for election in 2006. This design has the candidates information imprinted over the Nebraska state silhouette. Political campaign yard sign design for the Pennsylvania Primary Elections on May 9, 2006. Ready made sign design can be ordered online at www.SignOutfitters.com This sign is available in a weather resistant poster board version and also in a corrugated plastic version. State of Nebraska theme based bumper stickers and Car Magnets are also available at a reduced price when ordered with yard signs. Warning Pennant Strings Can Cause Rubber Necking. Pennant Strings have been around for a long time. They have traditionally been used to help advertise grand openings, auto dealerships, and almost any other promotion or event that you can think of. Pennants are being used to advertise events today as much as ever before. They have a couple of features which make them a natural attraction to our visual sense. Bright colors (sometimes metallic reflections) and movement draws the eye to the pennant string and ultimately the business or event that is being promoted. For your greatest impact replace your strings often. Fresh crisp pennants will attract the eye more than drab worn out ones. Pennant strings can be used for a variety of promotions. Use them to promote your business, event, or political campaign. A pennant string is ideal for retail store and brand identification, business grand openings, real estate sales and sales promotions. Our most popular pennant string is available in over 30 color combinations. Use our checkered flag pennants at the finish line of your event.